When I visited Masjid al Haram for the very first time, as per common practice in Pakistan, I left my shoes outside mosque’s door. After completing my Umrah, when I returned to pick up my shoes what I saw was a shining floor like there was nothing over it – ever. The floor was washed and cleaned by mosque cleaners a while ago. I inquired the near-by mosque helper about sandals put outside mosque and in reply, he pointed towards a huge pile of shoes in a corner. Shoes in all sizes and shapes. I made a useless attempt to look for my flip-flop but it was like finding a needle in haystack. The same guy told me, take any one of them and leave. No issues. I was feeling like a dumb. How can I steal a thing? from a mosque? And even when the mosque is Masjid al Haram, the most sacred mosque on earth? He said to me again, don’t worry; it’s allowed here; one can take whatever fits him; no one finds his shoes again in this pile. Later, I heard that this had happened to a number of my friends who visited the mosque for the first time, they never found their shoes. 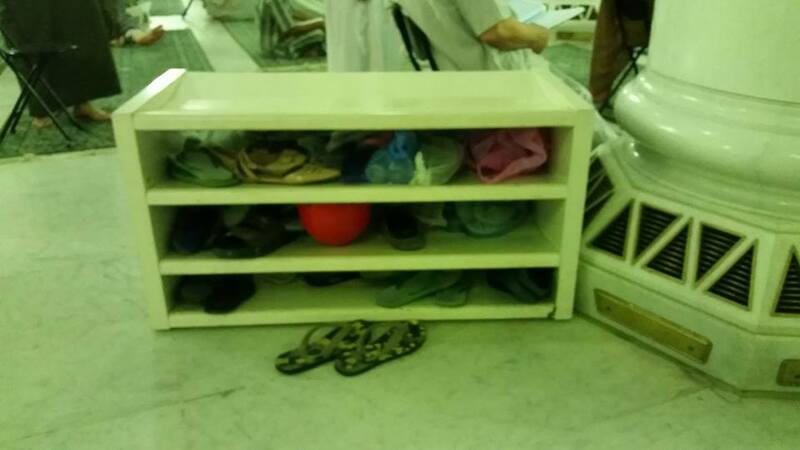 Put shoes in shoe-racks inside mosque. There are some designated places inside Masjid al Haram and Masjid Nabawi where one can put his shoes. Masjid e Nabwai has shoe-racks outside mosque as well, near entrance gate of tomb of Holy Prophet Muhammad (PBUH). However Masjid al Haram does not has this facility. Anything away or outside these shoe-racks would be wiped out by Mosque cleaners. Shoe-racks inside Masjid al haram. Each rack bears a unique number for easy remembering. Since both mosques are huge, the problem in this case is that one may forget the exact location of shoe-rack where he put his shoes. And even if he remembers, he may have to walk for at least 10 to 15 minutes to reach that place after completing Umrah. On average, as per my calculations, an individual usually walks around 7~8 kms while performing Umrah. This is from entering to leaving Mosque. Most probably you won’t want to do some extra mile to pick-up your shoes after completing Umrah when you are a bit tired. The best solution is to carry shoes with you. The best option, per my experience, is to put your shoes in a polythene bag (make sure shoes are clean with no visible Najasah or impurity) and carry them with you throughout the period. Usually helpers at main doors of Masjid al Haram also provide plastic bags for shoes, free of cost. However there is no certainty that you will find one as visitors to mosque are hundreds of thousands in numbers and supply of plastic bags is limited. So it’s better to take your own polythene bag from your apartment/home. 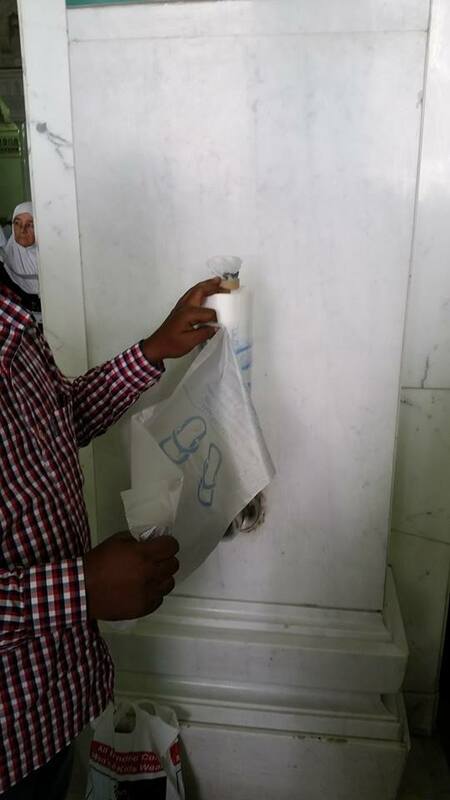 A helper distributing polythene bags at entrance of Masjid al Haram. However if in any case you have lost your shoes, there are shops around both mosques where you can purchase flip-flop in 10 SAR. It’s better to send someone to bring shoes for you as marble outside mosque will be burning hot at noon. Don’t make mistake of going to shop yourself bare footed in day time. I think the best option is not to wear shoes.